You are here: Home / Archives for Jinsung Refrigerator Ind. Since its establishment in 1991, Jinsung Refrigerator Industry has continuously been engaged in the refrigeration industry and also actively working for years in the fi eld of manufacturing assembled refrigeration bodies. A vehicle-mounted electric eutectic cold top was fi nally developed by Jinsung based on its unique know-how and new high-technologies accumulated during 20 years of experience and research in the manufacture of freezing equipment and panels. Jinsung is committ ed to becoming a leading company in the refrigeration industry through improvement of the two major problems in the transportation of frozen and cold storage foods – namely, unstable temperature during transportation, and high maintenance costs. Eutectic cold vans are widely used around the world with advantages for the transportation of frozen food by providing secure constant steady temperature under eco-friendly conditions of low noise, reduced emission of CO2, energy effi ciency, cost eff ectiveness, and prolonged life of vehicles, all by using the power of electricity instead of truck engine or sub-engine. Launched in 1991, Jinsung Refrigerator has since then been professionally engaged in manufacturing refrigeration equipment and eutectic cold tops. Jinsung Refrigerator’s eutectic cold top is appropriate for use in hot climates, where eutectic cold top vehicles for freezing storage can reduce fuel costs, environmental pollution and operational noise. With it, users do not need to operate a refrigerator att ached to the car engine. When operating the refrigerator with AC power (220- 380V), the PCM (Phase Change Material) panel inside the cold top is slowly cooled down to -45째C, thus being charged with chill. While the vehicle is running, the stored chill is slowly emitt ed, thus stably maintaining the interior temperature at -30~-20째C. It is strongly recommendable for users wishing to transport frozen food, ice cream, seafood, etc. in hot climates. Thus, the refrigerator is operated regardless of the car engine’s operation. Given that high oil prices are increasingly appearing as one of the major obstacles to operating businesses normally, the product is gaining a very good reputation among these industries. Jinsung Refrigerator is seeking to increase the size of the existing fl agship markets including the Middle East, Russia, Australia, Brazil, Hong Kong, etc, while further pioneering new potential markets such as the U.S.A, Europe, North Africa, etc. 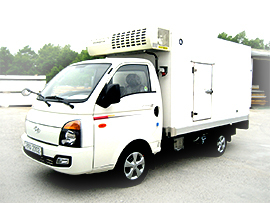 Filed Under: KOTRA Tagged With: Innovating the Refrigeration Industry, Jinsung Refrigerator Ind.